With a brick and siding facade, this Traditional features a front-entry garage for convenience. Gables direct eyes up, making the home appear larger, while circle-top transoms create architectural interest, softening exterior lines and angles. 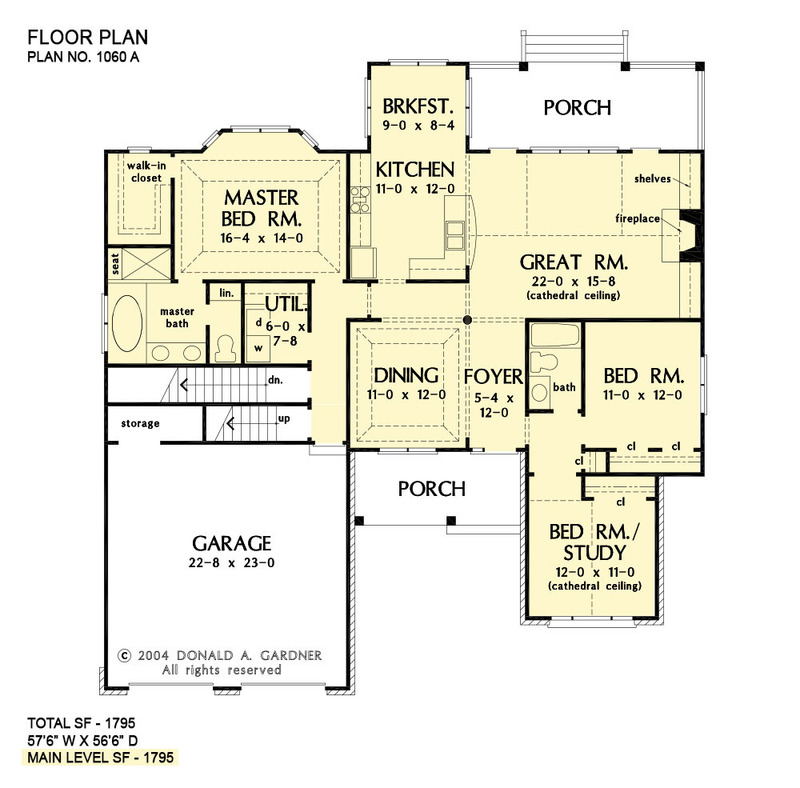 The open, family-efficient floorplan allows a natural traffic flow. Decorative ceilings enhance the dining room, great room, bedroom/study and master bedroom. Combining beauty with functionality, built-in cabinetry borders the fireplace, while French doors flank triple windows. Front and rear porches take living outdoors, creating areas for entertaining and relaxation. A versatile study/bedroom and bonus room add flexibility, and a bay window complements the master suite, extending floor space. 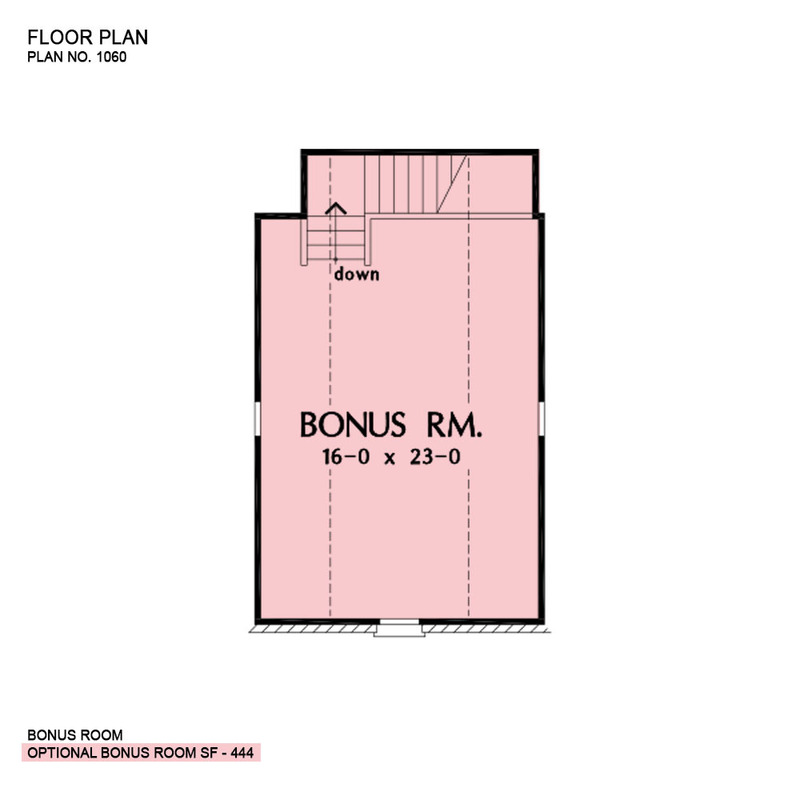 1st Floor: 1795 Sq. 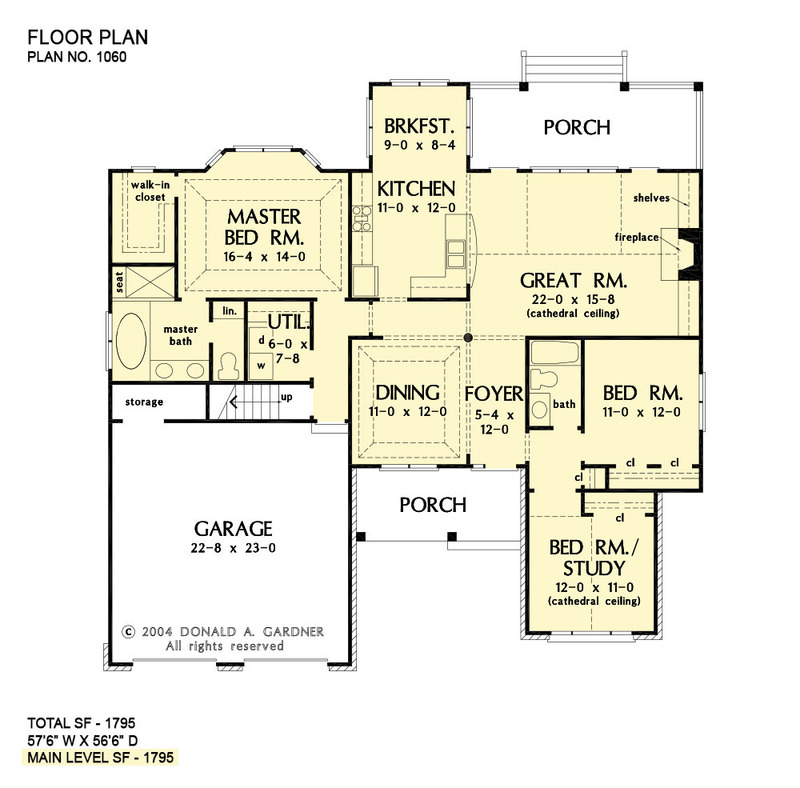 Ft.
House Dimensions: 57' 6" x 56' 6"
Great Room: 22' 0" x 15' 8"
Master Bedroom: 16' 4" x 14' 0"
Bedroom #3 : 11' 0" x 12' 0" x 9' 0"
Porch - Front : 15' 9" x 7' 0" x 9' 0"
Porch - Rear : 22' 4" x 8' 4" x 9' 0"
Foyer : 5' 4" x 12' 0" x 9' 0"
Dining Room (Tray): 11' 0" x 12' 0" x 10' 6"
Great Room (Vaulted): 22' 0" x 15' 8" x 16' 6"
Kitchen : 11' 0" x 12' 0" x 9' 0"
Breakfast Room : 9' 0" x 8' 4" x 9' 0"
Utility Room : 6' 0" x 7' 8" x 9' 0"
Bonus Room : 16' 0" x 23' 0" x 9' 0"
Garage : 22' 8" x 23' 0" x 0' 0"
Master Bedroom (Tray): 16' 4" x 14' 0" x 11' 0"
Bedroom / Study (Cathedral): 12' 0" x 11' 0" x 12' 8"